We are entering a new era when it comes to the trade off between economic development and archaeological heritage. There are now new instruments and methods available from geophysics for recording in non-invasive ways buried archaeological sites and their features. At the same time, following the establishment of the Valletta Convention by the countries in Europe (first put forward in 1992 and then updated in 2007), there has emerged a new approach to public policy when it comes to defending the archaeological patrimony of its landscapes and its cityscapes. Edited by Federica Boschi, the book under review takes up the important task of offering a comprehensive account of where we stand today. Looking to the Future, Caring for the Past is the fruit of two years of the Summer School (2013-2014) organized by the University of Bologna, which brought together scholars from a number of EU countries and students with an interest in learning more about Preventive Archaeology – the name, in shorthand, now given to this field of inquiry and practice. The challenge is concisely laid out by Boschi in her introduction to the volume: “Throughout Europe, and especially in Italy, there is a growing need to reconcile the everyday development and demands of city life and an increasingly busy countryside with the interests of archaeological research and the protection, whenever possible, of the cultural heritage passed down to us.” The reconciliation of the two sides entails a complex and delicate balancing act, as set out clearly in the volume. The obvious parallel is with “Preventive Medicine” in the field of health care. In medicine, one observes over the the course of the twentieth century a shift from a primary focus on curing diseases once they arise to keeping them from happening. This represents a win-win situation for societies today. In practical terms, the shift is driven by two main factors: (1) the aging of populations in Europe and (2) the steady growth in the rate of medical costs in a given country (commonly higher than its annual growth rate in GDP). Over the long run, this is clearly not a sustainable situation. The challenge for modern medicine (and for public policy in a wider sense) is then to address these two problems. Part of the solution is to place greater emphasis on preventive medicine: that is, to promote the well being of the individual and to develop strategies to reduce the occurrence of many diseases (or else to attempt their early treatment when costs are often lower). This means, in effect, that a given society has to work harded to improve its nutrition (in particular, the avoidance of obesity), to continue lowering its level of tobacco consumption, to promote healthy exercise, to maintain low cost programs of immunization and to facilitate medical examinations on a regular basis. All of this is today quite well known. A point that needs to be underscored is that Preventive Medicine calls out for a broad-based approach. In other words, there is no silver bullet – no one single answer -- to rely upon when it comes to public policy in the field of health care. What is paramount is the integration of the respective components into a comprehensive strategy. The suggestion is that this will also hold in the cae of Preventive Archaeology, as the field grows and matures. The book under review represents a good step in this direction. Here the main focus of my attention will be on the situation in Italy where I have had the good fortune to conduct archaeological fieldwork for the last 45 years. To start with, Bel Paese is a country with a remarkably rich and diverse archaeological recored. Its celebrated sites attract large numbers of tourists from around the world each year. On the other hand, the guardianship (la tutela) and the management (la gestione) of such a rich cultural heritage will always entail serious challenges (le sfide), given the considerable cost of its maintenance and protection. At the same time, Italy has a large number of well-trained archaeologists, and some of them are now taking an active interest in the development of less invasive ways of doing archaeology. In this respect, those in Italy are following the lead of their colleagues in France, Germany and the UK. In the sphere of public policy, Italian archaeology tends to lag behind the other large countries with advanced economies in Europe. A good example of this is the length of time it took for Italy to approve the Valletta Convention. Indeed, it would take 23 years before the Italian government officially approved it and finally climbed on broad in 2015. In short, archaeologists from other countries who have the chancde to work in Italy for any length of time soon learn to be patient and take the long view of things. At this point, it is worth making a brief digression and saying a few words about how the perception of archaeology on the landscape evolved during the twentieth century in Italy. If one goes back to the years between the two world wars, there were vast projects of land reclamation carried out, for example, in the Agro Pontino and at San Dona del Piave. While such public projects often involved the complete transformation of the landscape, they showed little or no awareness to their impact on the archaeological record. In the years immediately following World War II, it was still possible to build long stretches of the autostrada from Milan to Rome and then on to Naples without taking archaeological heritage into proper consideration. Indeed, this orientation could even persist as late as 1974, when the Italian government funded the large-scale project of landscape restructing at Gioia Tauro (as part of the creation of the fifth steel-making center in Italy; this project was never completed, and it eventually produced a container port). At the time, I happened to be in Calabria where we were starting the first year of an archaeological survey conducted in affiliation with the new Università delle Calabrie at Rende. In the same year, I also made a visit to Aldenhoven in Germany where the region and a coal company with a large, open-cast mining operation were working together on the systematic excavation of a whole landscape. For a length of 5 kilometers along the Merzbach Valley, a large team of archaeologists excavated more than 12 Neolithic settlements in their entirety – in advance of giant digging machines slowly moving across the landscape. Once the brown coal was extracted, the vast open pits were filled back in, and the landscape was restored. Returning to our work in Calabria, it was still unclear in 1974 whether or not there were Neolithic settlements to be found on the landscape there. Not much fieldwork had previously been done on the region’s prehistory.. Now by doing intensive and repeated coverage of the landscape at Acconia (as well three other areas in Calabria), our survey was able to show that the region did have several places with dense patterns of settlement in the Neolithic period. The work then continued at Acconia by doing, in combination, a magnetometer survey, a large number of cores and a series of excavations at the Neolithic site called Piana di Curinga. In turn, this made it possible to document that the settlement had a total of 48 wattle-and-daub houses dating to the sixth millennium BC. All of the fieldwork at Acconia was done over a span of just seven years. This case study provides a good example of how rapidly the archaeology of a region can change once new field methods are brought into play. With the arrival of the 1980s, the pace and the quality of archaeological fieldwork began to pick up both in the countryside and in the cities of Italy, including Rome itself. New perspectives and sensibilities were beginning to emerge in the field of landscape archaeology. Moving fast forward, we reach 2009 when the innovation of “planning led archaeology” made its first appearance in Italy in the context of the construction of a new motorway that linked the cites of Brescia, Bergamo and Milano and ambitious project known as BREBEMI. Its motivation, goals and history are reviewed by Stefano Campana in the second chapter of Looking to the Future. This volume is the important product of two Summer Schools entitled Preventive Archaeology: evaluating sites and landscapes, which were held in June and July of 2013 and 2014 respectively. The project was organized by the Department of History and Cultures of the University of Bologna within the context of the Erasmus Intensive Program. Federica Boschi took the lead in its organization both years as well as in editing of the book that came out of the Summer School. In all, there was the participation of 25 lecturers from eight countries, and a total of 66 students from many different countries took part the program during the two years. In addition, several institutions and a number of individuals in the region of Emilia Romagna contributed to the success of the program. One of the main purposes of the Summer School was, of course, to bring together scholars and students from different countries so that they could share their own national experiences and exchange ideas. The program was based at Ravenna for the theoretical lectures and then went out for work in the field to several archaeological sites: Ravenna and Classe in 2013 and Senigallia and Civitalba in 2014. Emphasis was placed on the new EU public policy of “planning-led archaeology” and on the non-invasive approach to investigations conducted in the field. The latter can also be called “non-destructive field evaluation.” Its aim is to come up with good alternatives to the archaeological excavation as a means of doing Preventive Archaeology. Toward this end, the students had the opportunity to learn both in the classroom and in the field about cutting-edge instruments for large-scale geophysical surveys and remote sensing applications. Looking out to he near Future, we can expect that the instruments now available and the methods for processing their large data sets will only get better each year. 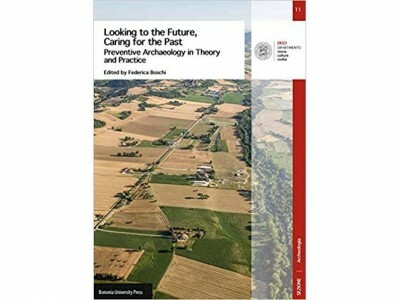 The book has three main sections: (1) “Preventive Archaeology”: the role of diagnostics, (2) Cases of studies between research, teaching, management and prevention and (3) Methods and techniques. The book closes with a chapter on the Summer School on the field – a coda on the case study carried out by the staff and students in 2014 that integrated aerial and geophysical surveys at Civitalba in the Marche. The last chapter captures the energy and the good-natured spirit of the Summer School. This is not the place to review each of the 20 chapters. At this point, it is worth complimenting Federica Boschi on the excellent job that she managed to do in editing the respective chapters. All of them are well organized and accessible to the non-specialist. Editing such a volume is not an easy task, and Boschi shows here skills far beyond her years. One of the few things missing from the Book is the use of coring in archaeological research today. Coring represents a minimally invasive way to conduct the ground truthing of the imagery produced by remote sensing and geophysical prospection. Returning to the parallel with modern medicine mentioned above, it is a field that integrates three complementary lines of analysis: scanning (non-invasive), biopsy (minimally invasive) and surgery (invasive). Each of them has its own role to play in medicine today. In archaeology, coring stands awkwardly between a purely non-invasive approach (geophysical prospection) and a fully invasive one (excavation). In a book whose focus is on taking a non-invasive approach, it is fully understandable that so little attention is paid to coring. On the other hand, it does form the missing link, as it were, between prospection and excavation. In public policy concerned with archaeology, as it is undertaken Italy and the European Union, one should avoid drawing an arbitrary line between non-invasive methods and invasive ones. There is the need for a more nuanced position – one that makes due allowance for the middle ground of minimally invasive methods -- as in the case of biopsy in modern medicine. Here it is worth recalling what Martin Carver recently wrote in 2015 in the preface of Field Archaeology from Around the World: Ideas and Approaches, on the need to keep the practice of public archaeology open and flexible: “not much has changed in field archaeology over the last 20 years. The reason is easily explained. As the commercial profession was formed, field methods became standardized and, due largely to national economic and political pressures, it got struck in its ways.” The challenge for us today is then to strike a more delicate balance.